The healthy glow of Christmas/Yuletide/Winterfest has given away to the limbo that exists before the turning of the year, though still time for a final Utherwald post of 2014. Now I've already mentioned a couple of conflicts in the setting, the historical Great Darmonican War (a sort-of analog of our own First World War) and the 'current' Wulver War (probably better described as 'militarized pest control'). But I've been wondering whether to have a BIG conflict raging? Thinking of perhaps drawing out the Great Darmonican War, little bit like how WW1 lasts for 50 years in the video game Iron Storm. This could make the War the central part of the setting, also provide opportunities for possible plot ideas. Though it does provide ideas for another nation or two. The Coalition:- Formerly the United Provinces of Garrack, an alliance of companies and corporations effectively took over when the former neutral leaning government tried to restrict the sale of war materials. Now it is a country devoted to war profiteering, great factory towns work ceaselessly night and day to fuel the war efforts of the actual combatants whilst remaining far removed from the fighting. Tyland Free State:- Originally the Kingdom of Tyland until its defeat in the Tyland-Artian War that predates the Great Darmonican War, the Free State rose from the ashes of the late Kingdom's collapse (and brief Artian occupation). Presently fighting for its very existence (and revenge) against the Artian Confederation, though as an alliance of a sorts with the Commonwealth. Sultanate of Taramate:- A supposedly neutral realm located in the south, though has had border skirmishes with Artian, Commonwealth and Union of Sodkan Republics forces. The Commonwealth colony of Orduesh is located on the Sultanate's southern edge in a rather precarious position. Pamayan Protectorate:- Former Tylander colony made of a cluster of islands, since occupied by Artian forces since the end of the Tyland-Artian War. Currently embroiled in a low-level conflict of its own as Tylander rebels try to free themselves from Artian rule and as the Commonwealth attempts to gain an island or two for its own ends, sometimes leading to a three-way battle. Thats all for now, though if folks have nay thoughts on the above then please feel free to post a comment. Other than that, Happy New Year all! 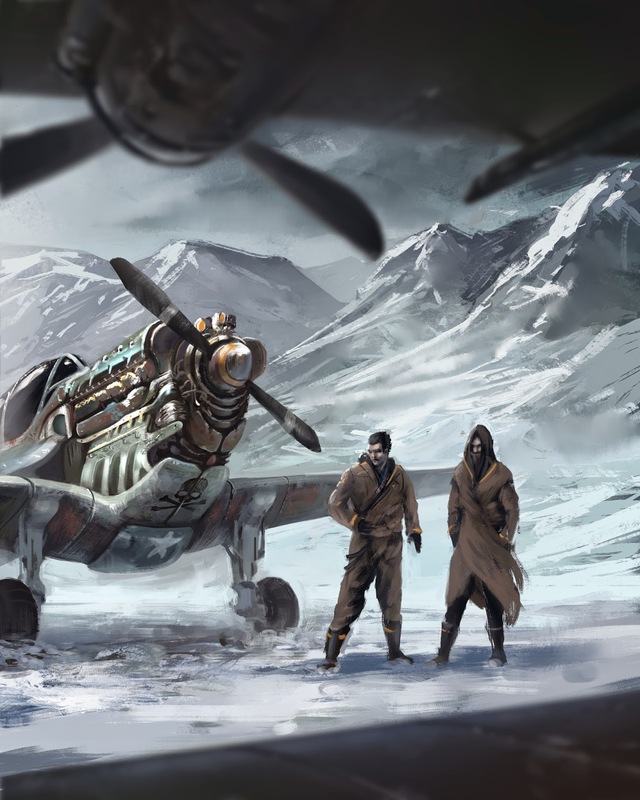 Newest piece of artwork for Frozen Skies is done and my does it look awesome. I've mentioned the Holy Sodkan Empire and its main successor the Iron Collective a few times now, but I've never gone into much detail on either. In this week's entry I hope to address that. A couple of centuries ago what was then the Sodkan city-states started openly warring against one another, though skirmishes between sellswords hired by the different city-states had been going on for generations. This time it was different as the guards of the city-states themselves took to the field and cities were directly attacked, though for the most part the guards were little better than militia more comfortable with patrolling the city streets than the battlefield. Though one man had put the effort into making sure that the forces at his disposal was a professional army, that man was Antov Serlov. With his city-state on the western Sodkan frontier Serlov needed a standing army to fend off against raids from the various Artian states, prior to their Confederation after the Tyland-Artian War a century later, so when he came up against other Sodkan forces he was able to beat them in a series of crushing defeats and declare himself ruler of all of the Sodkan lands. Serlov was crowned Emperor and set about building himself an empire, adopting the Cult of the Great Maker as the new nation's religion. His heirs inherited the throne over the years until Polina Serlov became Empress shortly before the onset of the Great Darmonican War. The War went badly for the Empire when it found itself being attacked directly by the Commonwealth, leaving the Sodkans unable to help their Tylander allies against the Artian Confederation. Worse still unrest was starting to undermine the Empire's war effort, spurred on by the radical religious sect the Order of the Great Machine. The Order made it difficult for the Empire to conduct any major military action as the Empire was forced to redeploy troops to deal with the unrest that was spreading like wildfire across the country. Out of desperation Empress Polinia Serlov gave approval for militarized versions of the Sodkan 'Tin Men' to be produced, with a view of deploying them against the Order. The Empress visited the Sodkans' main research base to view the first prototypes, however an accident occurred that caused an explosion that destroyed the base and devastated the surrounding area. It is widely presumed that the Empress perished along with the rest of the base's personnel on that fateful day. With the Empress gone the Order of the Great Machine quickly set about seizing power, they also withdrew Sodkan forces from the still raging Great Darmonican War which allowed the joint Commonwealth-Artian forces to crush Tylander forces and win the war. Cut-off by from the rest of the old Empire by the Blast and the devastated area now dubbed the 'Gloomlands', the southern Sodkan provinces formed the Union of Sodkan Republics out of mutual defence and shared paranoia. The bulk of the old Empire became the Iron Collective, ruled over by the Order who set about forming a technological theocracy that the rest of Darmonica views with a wary eye. The Order imposed a new system where every man, woman and child was viewed as simply a cog in a great machine with each having its own role to play. The Collective's education system mainly focuses on determining a role that a person is best suited for and giving them the training needed for that role, the idea being that the role would be a job for life. The old social norms of family have been stamped out and replaced with a system of groupings that people are placed into, with people being matched to and paired together. Each couple are given a quota for the number of children that they are expected to produce, though the actual number depends on a variety of factors such as the pair themselves and local population levels. The resultant children stay with their parents until they turn five years old, at which point the state takes them into a 'academy' where they are tested to determine their future roles. The Order has almost completely rebuilt Sodka, rebuilding many towns and cities to have more efficient road layouts. Roads and railways have been rerouted to make them more efficient to better serve the Collective's industries and to ensure the Collective's standing military, the Iron Guard, to be transported with ease. The Collective has very little contact with its neighbours with trade being limited to small traders that operate along the fringes of the Collective, though it is risky since external trade is largely illegal in the Collective.